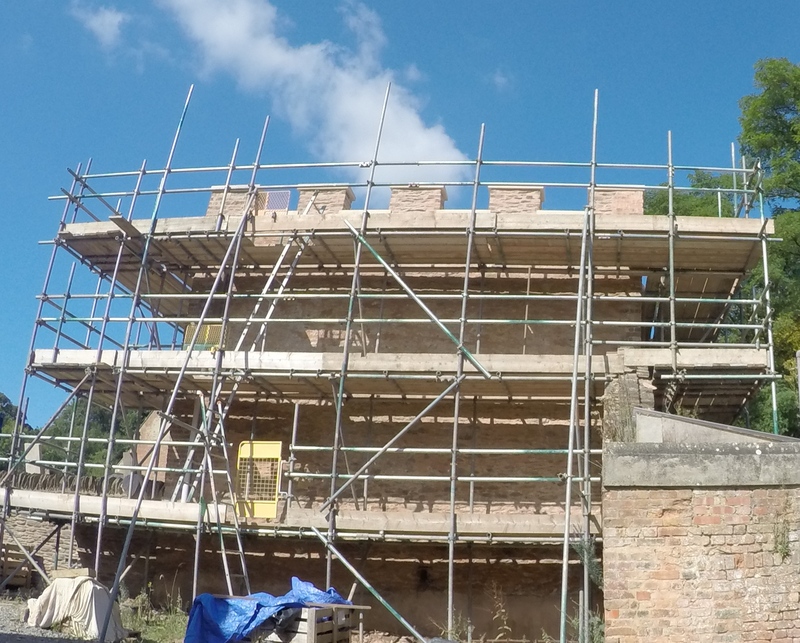 The coach house under scaffolding while undergoing its full restoration. The Coach house, or a building of similar proportions, was on this site by 1756 when it was recorded on the earliest surviving estate map. It is Grade II listed but until this year appears to have had little repair work since it was built. 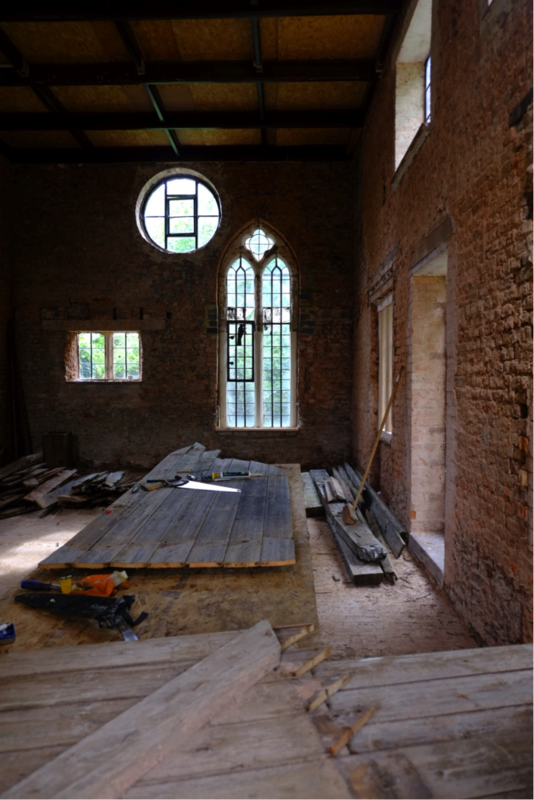 The entire roof structure was being held up by the insertion of two 1950’s red brick partition walls beneath the two original eighteenth-century cross beams. The roof structure as it was before restoration in 2015. 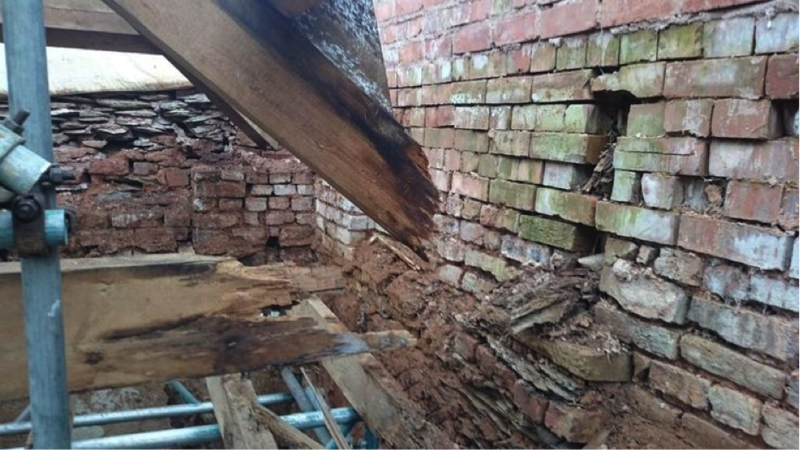 Above that the roof structure had completely rotted away from the walls into which it was originally supported. The lead guttering within the parapets had failed allowing water to pour over the woodwork. In some cases the battlements themselves had fallen over and into the already damaged lead guttering. 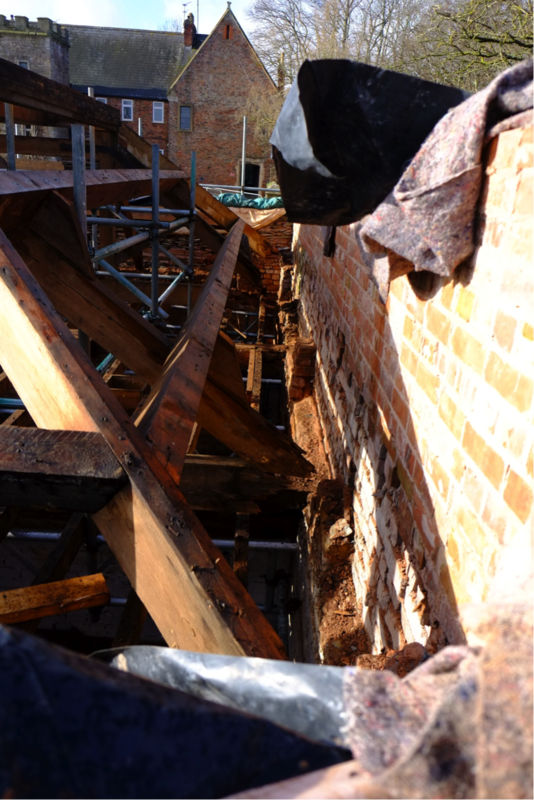 Luckily the leadwork above guttering level was in fairly good order so the rest of the eighteenth-century timbers could be saved by splicing new end pieces onto each one. 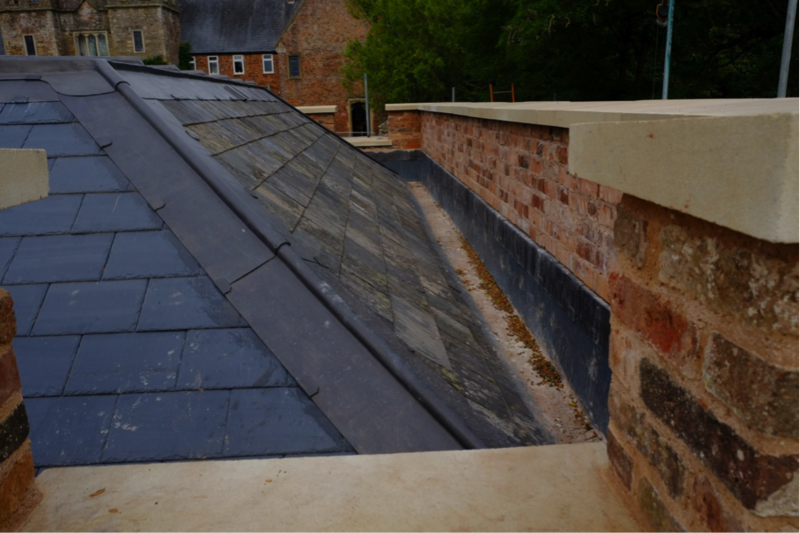 The roof void area designated for the new bat roost, assessable through openings in the slate and lead roof. 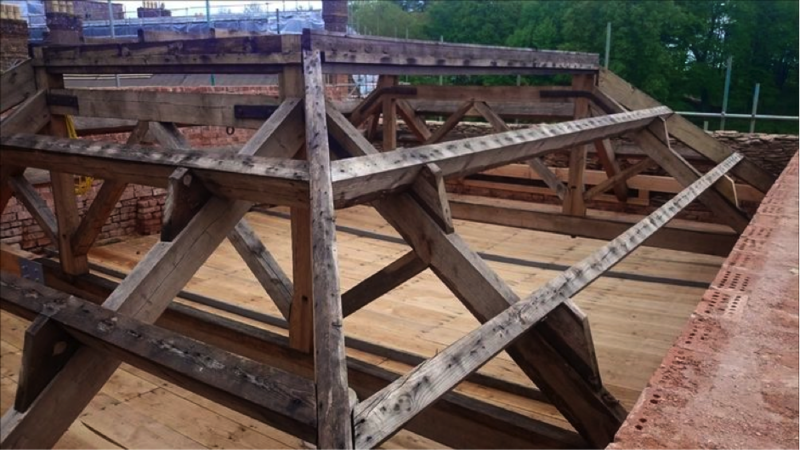 While this woodwork was being carried out the stone and brickwork to the battlements could also be taken down and re-built using the original materials where possible, and new cut masonry where needed. The three keystones in each of the archways had also failed and were in danger of collapsing, taking the building with them. 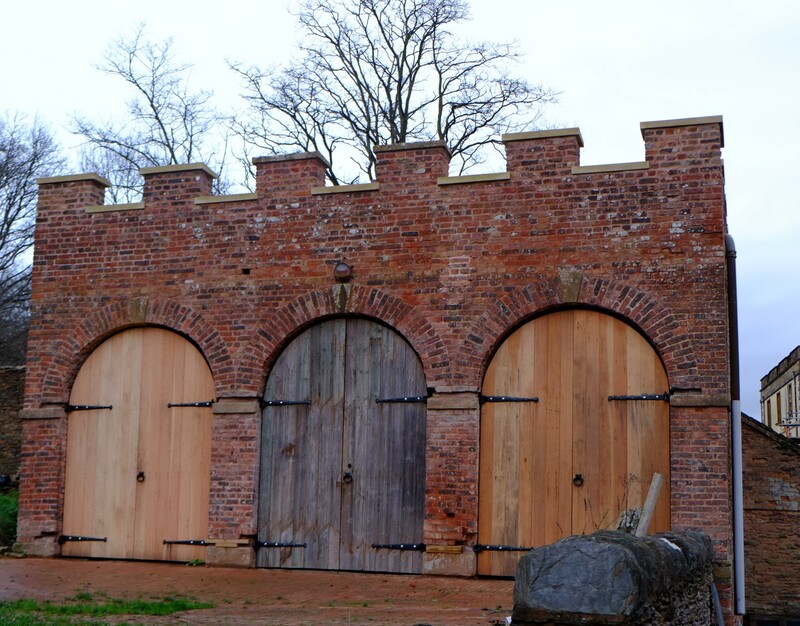 The entire building was re-pointed, and although the earlier doors had all but rotted away, we managed to remake one door out of the usable remains of all three, thereby retaining as much of the original materials as possible. The flanking two doorways were entirely made by the craftsmen at Corbel Conservation in our onsite workshop. We also repositioned the three doors into their original positions, which were underneath the arches and recessed by a few inches. This protects the doors from the elements, rather than leaving them exposed, as they had been since the nineteenth century. The hinge circled in yellow is in its original eighteenth-century position. The later hinge circled in blue is from the nineteenth-century hanging of the doors, outside the archway instead of within it, as originally intended. Edward Strachan overseeing works with Mark Lidster of Corbel Conservation. 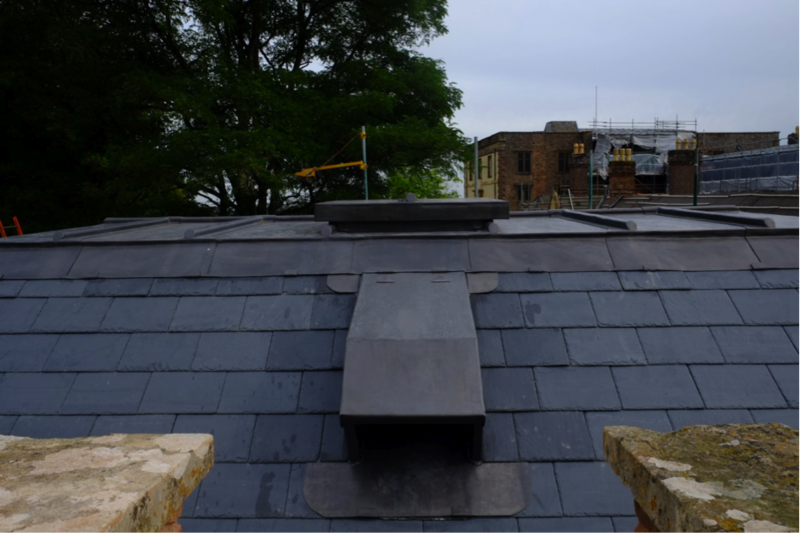 The large and until now empty roof void has been converted to become the estate bat roost, by way of creating bat openings within the roof slates themselves. 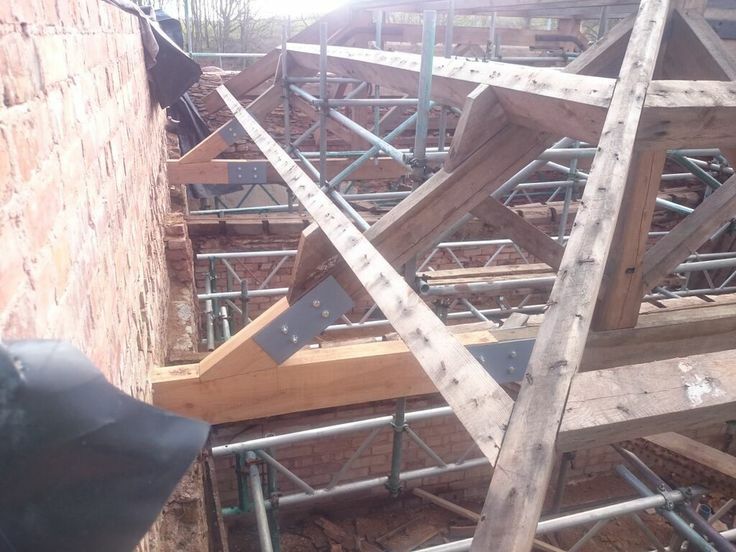 The bats had, until the creation of this new roost, taken hold of the house and caused restoration delays of over a year within the main buildings. It was vital that this new roost was created in time for the roosting season, so that the bats could be moved by ecologists to this new and rather commodious home. 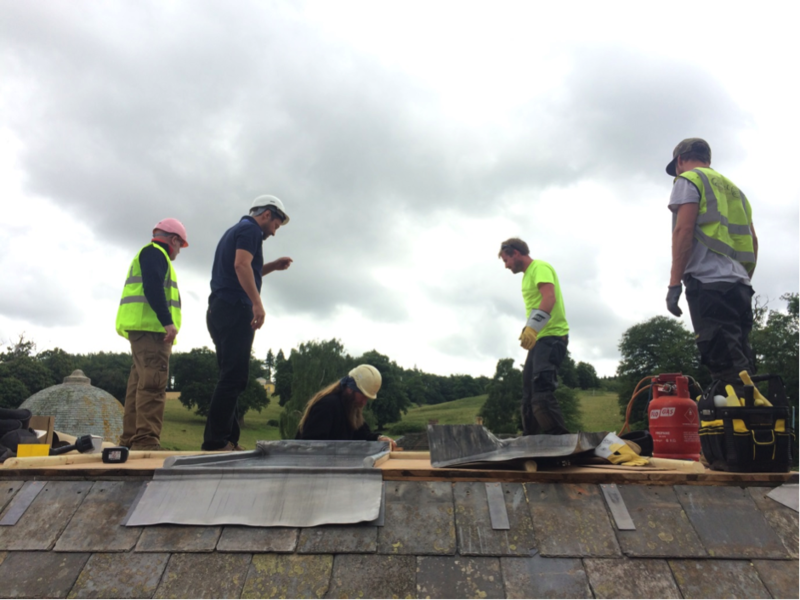 Without a new and suitable home for the various species of bats that thrive at Halswell the essential roof repairs could not begin at the manor house. The Coach House dereliction was brought on by it becoming no more than storeroom, as such the economy for maintenance simply was not there. 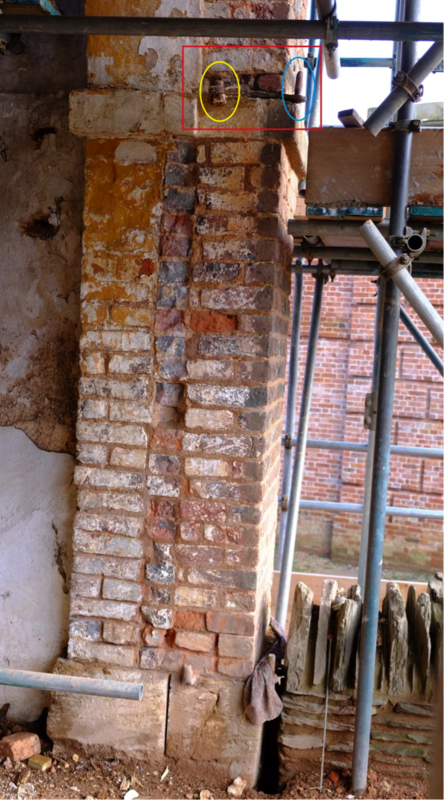 As with all other building restorations at Halswell we feel it is vital that each building has a purpose that will help to ensure its maintenance will be continued properly for generations to come. To that end the Coach House will be given two new leases of life. The first is as a permanent bat roost which will also become an interactive space, not just a forgotten loft. Infrared cameras will be installed to monitor the bats’ progress, which will be beamed to screens in the room below. 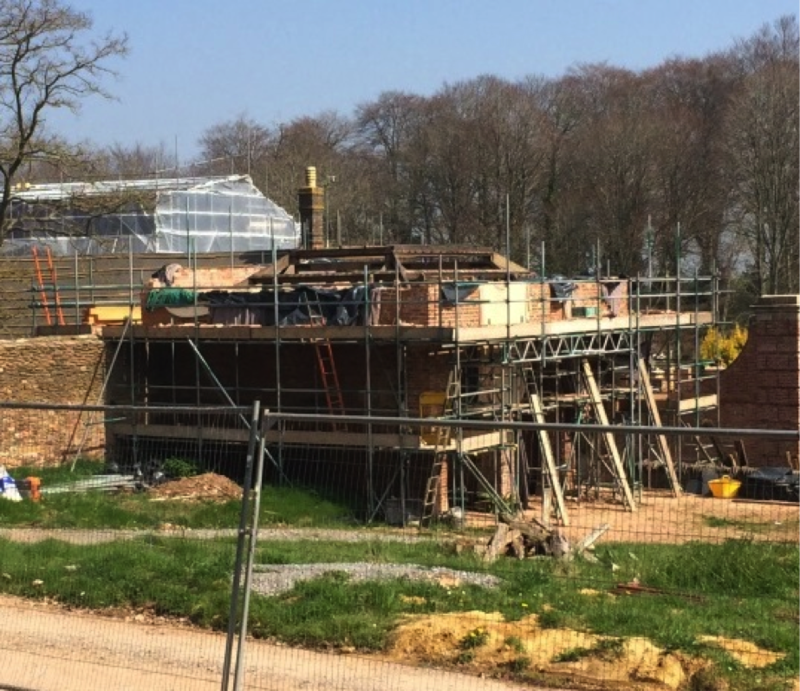 Further future-proofing of the building is being ensured by the creation of a viewing area within to display the workings of the estate’s ecologically sound Ground Source Heat Pump System. Heat converters will be housed in the coach house for distribution of naturally occurring heat from below the estate meadows. This will turn the derelict and near ruinous C18th building into the ecological nerve centre of Halswell in the 21st century and beyond. The battlements and east wall being renewed. The final finish: An ‘original’ eighteenth-century door in the centre, made using the salvageable materials from all three doors, flanked by two new doors made using the same traditional techniques and hung on new ironmongery in the original, recessed, C18th positions.